Combine dune-bashing and sandboarding on this morning safari from Dubai. Booking these activities separately may be time-consuming, but this tour combines them and takes care of all the details. 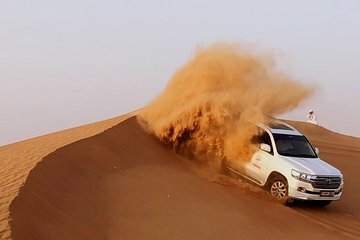 Head out into the desert in a 4WD vehicle driven by an experienced guide, where you'll slide up and down the dunes on a wild ride. Switch to a sandboard to go flying down the tall dunes, take a ride on a camel, then follow up with some refreshing beverages before returning to the city. Faisal was an amazing guide and the dune bashing was thrilling. We went sandboarding down untouched dunes and finished the Safari with a camel ride. This Safari and the guide is highly recommended!